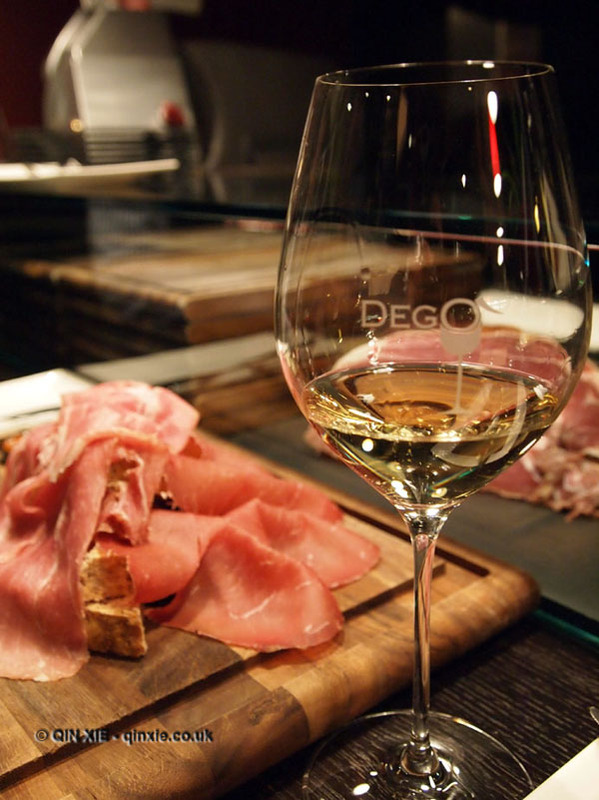 An exploration of wine led me to Degò; an Italian restaurant and wine bar that’s so far removed from its Oxford Circus surroundings it leaves you disorientated. How do you explain its concept? “Devil’s in the detail” perhaps, which is what might be invoked when your eyes set upon its red and black theme. So potent and masculine is the colour, and all hard wood and sleek granite. Yet, there’s also a hint of femininity – the curvature of the bar upstairs, and elsewhere, all moulded around the glass of Franciacorta. Incidentally this is the sparkling wine, produced via the same method as Champagne, you really ought to indulge in. Degò has chose to stock only Franciacorta by Villa and it stocks it exclusively. The music in the wine bar, played on a bespoke sound system, always falls in the background facilitating ample conversation. The wine selection, mostly Italian, some French and a generous few exclusive to Degò, paired with the cheese and charcuterie is equally adept. In a rather unusual fashion, the board of cold cuts is served with a sauce of sweet chilli which works surprisingly well with the La Tur. Stairs, black marble inlaid with red, leads down to the restaurant itself where the theme continues in a more prominent fashion. Breathtaking is probably not the right word for it. Over a thousand panels of red hued leather adorn the walls, creating a womb of shimmery rouge. The low and boothy seats encourage the Casanova position – that is, a sideways seductive recline against the supple leather, one hand supporting the head and the other nursing the wine. And wine is as big an aspect downstairs in the restaurant as it is upstairs in the bar. A fact which was obvious from the wine coolers built into all the tables; a considered design. The food, leaning towards Venetian, is no less important and Degò has been furnished with two AA Rossettes and a place in the Good Food Guide. The bread platter is plenty and full of choice, but don’t fill up on these. 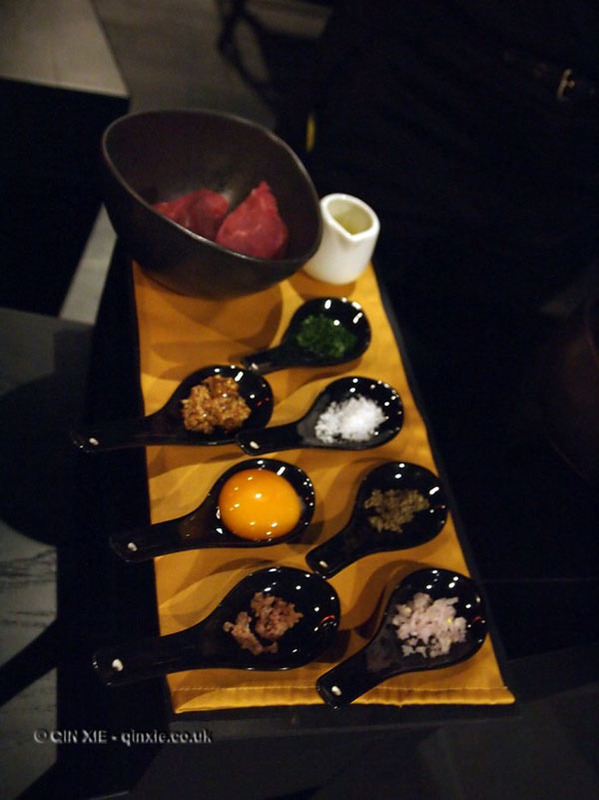 Start with the steak tartare for something a little different. Made to order at the table rather than in the kitchen, the meat is coarsely ground (it’s an Italian thing I’m told) with a perfectly balanced proportion of ingredients. 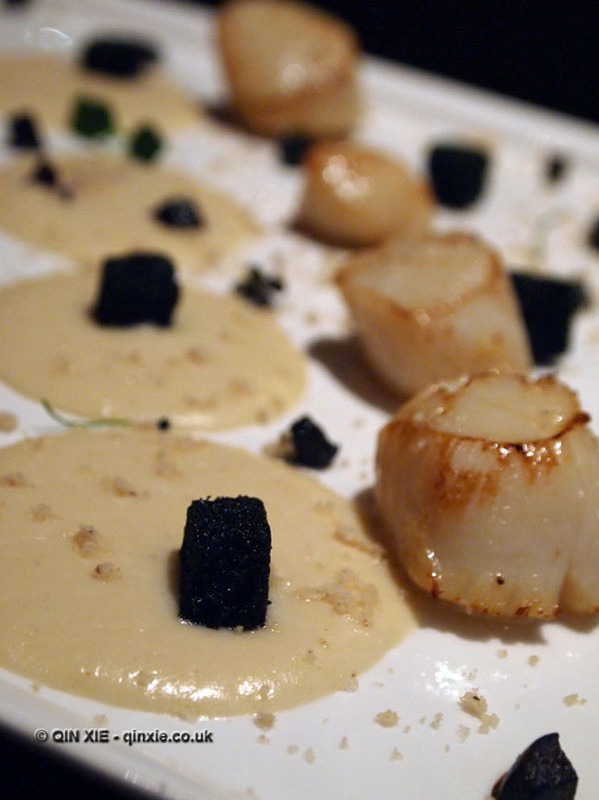 And while good, it doesn’t take your breath away in quite the same manner as the scallops with hazelnut cream and Amarone apples, which looks like a sandy rockpool artfully spilled across the plate. Drink Soave La Broia D.O.C. 2009 Roccolo Grassi for its crisp, balanced lightness. The veal chop serving as a main, though inspired by its Milanese counterpart, is much more generous in its portioning but no less tender. A side of frangipane potatoes, a dusting of lightly spiced crust, is a surprising addition but pairs beautifully with medium rare duck breasts and French beans. Opt this time for a dark and smokey I.G.T. Jeudi 15 2009 Vino di Anna, made by Anna Martens, the wife of Caves de Pyrène’s founder Eric Narioo. If you can, make room for the Bigoli with duck ragu too. A buckwheat pasta with a rich, gamey sauce will surely leave you feeling wholesome and satisfied. Or indulge in their selection of desserts instead, it will give you the same pleasure. The chocolate caramel meringue has the ginger sauce to give it a kick, though you might kick yourself for not ordering the rose parfait when romancing – it comes with a single red rose. Therein lies the detail of the whole operation. Call it cheesy if you like but really, it’s just flamboyant Italian.